Whatever happened to the promise of leisure time? • You might see one or two at a collector’s fair or antiquarian bookshop: dog-eared copies of Popular Science magazines from decades past, with covers promising a sunny future of expanded leisure time. There might be, for example, an illustration of a beaming Caucasian family in a hovercraft, weaving past city spires on a technicolour holiday. For years, 20th century futurists prophesized the contraction of working hours, insisting this would be a source of celebration rather than concern. There would be plenty of free time to take advantage of increased productivity and technological progress. Every other day would be Family Day. Even junior would have a jet pack. Only the first half of that proposition, the part about jobs disappearing, has turned out to be prophetic. It’s the second half about comfortable leisure time that’s gone sideways. From the factory floor grasslands of Detroit to the defanged ‘Irish Tiger’ of Dublin, the industrialized world is swollen with millions of surplus workers who are bunking with parents or couch-surfing with friends. The digitization of film, music, print and almost every other form of cultural output – automation, in other words – is accelerating job insecurity everywhere. There’s a saying in Chicago business circles: “If you’re not at the table, you’re on the menu.” So how did the underclass end up as toast for the .01 percent? How did we get from the can-do optimism of Henry Ford’s first assembly lines to today’s Age of Austerity, with levels of unemployment in the industrialized west not seen since the Great Depression? And why do so many of us seem to be working harder than ever, holding down multiple jobs for lesser pay, if we’re lucky enough to be in the job market at all? What happened to the promise of expanding leisure time from the spiritual ancestors of today’s TED speakers? Economists scratch their balding heads and litter their blackboards with chalk marks, but can’t seem to come up with consistent answers. Most insist that the free market, even one dominated by monopolies and cartels, is its own best solution. However, at least one scholar predicted the present disorder of high unemployment, diminished wages and globalization as a logical consequence of capitalism. His name was Karl Marx. In 1997, New Yorker economics correspondent John Cassidy recalled a conversation with a college friend who ended up working on Wall Street at a big investment firm. “The longer I spend on Wall Street, the more convinced I am that Marx was right,” he told Cassidy. “There is a Nobel Prize waiting for the economist who resurrects Marx and puts it all together in a coherent model. I am absolutely convinced that Marx’s approach is the best way to look at capitalism.” After this counterintuitive encounter, Cassidy dipped into an anthology of writings of the long-dead white male and discovered he was mostly in agreement with his friend. According to Marx, the capitalist pursuit of surplus value results in squeezing the worker for ever-greater amounts of output, most often by demanding longer hours. 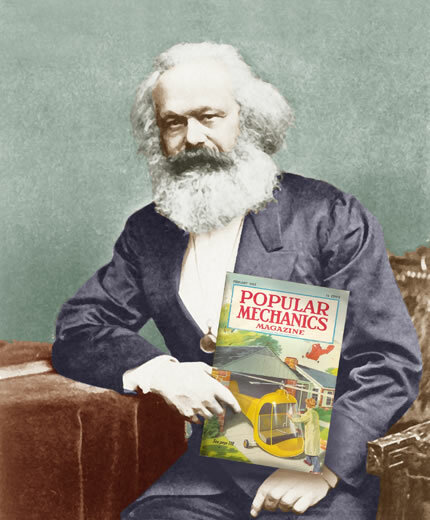 In his magnum opus, Das Kapital, the author rifled through reports of factory inspectors and newspaper articles to lift the veil on the horrifying working conditions in Victorian England factories, in which child labour was the raw material for the industrial revolution. Marx was referring to the “lowest sediment of society” – what we know today as the underclass – who would see a widening gap between themselves and the upper tiers as capitalism evolved. There are plenty of statistics showing that, over the past 40 years, income disparities have increased not just between the nations of the world, but within many of them as well. In a global race to the bottom, First World blue-collar and white-collar jobs have been outsourced to the developing world, in places free from bothersome labour rights and minimum wages. India is often held up as a winner in the globalization game, yet the nation’s growing middle class and a spearhead of obscenely wealthy nouveau-riche have done little to improve the lives of millions of immiserated slum dwellers in Mumbai, Calcutta and elsewhere. There is an unwritten history of the struggles of nameless men and women in Canada, the US and other industrialized countries, who organized and petitioned in the early years of the 20th century for the eight-hour workday and other workers’ rights. Today, the concessions wrung from big business by the International Workers of the World and the Cooperative Commonwealth Federation, among other groups, are in danger of being weakened or withdrawn altogether. For example, unpaid internships, which are nothing more than a way to extract free labour through hollow appeals to resume inflation, are now widely accepted and unquestioned. Deindustrialization began in the late seventies in the US and the jobs exported to other parts of the world for lower wages are boomeranging back to the continental US (“bringing the Third World home” in the words of MIT media critic Noam Chomsky). In spite of this unhappy pattern, some US economists are optimistic that the information economy will pick up the slack from years of downsizing, outsourcing, relocating and union decertification. Yet the hopes pinned on social media may be as dubious as the portrayals of hovercrafts and jetpacks in vintage editions of Popular Science – at least in the near term. To take just one sobering factoid, you could take all the employees from four of the biggest social media organizations – Facebook, Twitter, LinkedIn and Groupon – and seat them in Madison Square Garden. The average British employee now puts in 80,224 hours over his or her working life, compared with 69,000 hours in 1981. Similar figures hold in the US and Canada and that’s not including the labour voluntarily added beyond work hours, through email and other digital communications. Many of us are working harder for less than our parents did and growing numbers can’t find decent paying jobs of any kind. Productivity has gone up in North America for the past 30 years, while real wages have fallen or stagnated over the same period of time. Where have the profits gone? Mostly into the pockets of plutocrats, of course. That is the story of surplus value, retooled and retold for a technocratic age. The mad logic of gangster capitalism, in which bubble economies transfer wealth to the top even as they pop, has brought Marx’s overheated rhetoric and insightful analysis back for a second reading. Yet many activists on the left have doubts about the man and his associations. That’s not only understandable, but necessary. Marx’s ideas have been seized on by totalitarian villains who defined Marxism in their own terms – from Joseph Stalin to Pol Pot to Mao Zedong – to underwrite some of the worst atrocities in history. The elites would prefer that wageslaves distract themselves with every blade of grass, shrub, sapling and tree. At the dawn of the modern era, Karl Marx attached a box camera to a gas-powered balloon and photographed the entire forest from high above. The pictures have faded over time, but the horizon still looks much the same.